Over the last few months we've had a couple of video shoots over in Muskogee. Traveling to the various locations revealed a few interesting moderno style buildings amongst the azaleas. Here are a few we stumbled across. I noticed this unusual light (right) in the parking lot of Wall's Bargain Center. It appears light was emitted from the Saarinen-esque shape on top. Unfortunately we may never know. As darkness fell, it never lit up. The front of the Tony Goetz School has a distinctive maritime feel with the flagpole thrusting forward from a "keel" of sandstone. 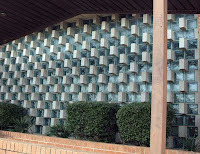 This school building also featured the wall o' glass treatment with glass bricks on the south-facing exposures. Here's an aerial shot of Muskogee Regional Medical Center. It's easy to see the building's many additions over the years. A three-wing expansion in the Sixties used an interesting zig-zag pattern. I assume the idea was to provide the most windows but with some level of privacy. Speaking of zig zags- this medical office building has a great awning and a very unique facade (below) made of glass and concrete block. I couldn't resist including that sign in the shot. Ooops... someone parked a pickup there! That's just some of the neat buildings we managed to photograph. We spotted others, like east end of the high school is kinda' cool, and I'm sure there are even more. Feel free to send us pics or links if you know of others. east end of the high school is kinda' REAL cool! I liked the angled flag pole at the school. It seems that I've seen the effect before but can't remember where.